In the past year I have become more and more interested in learning and supporting learners through coaching. It all started from working as an Assistant Team Coach for a Peruvian Team Entrepreneurs on their Learning Journey to Finland back in the spring of 2017. Since then I have been working with Team Academy Perú as an Assistant Team Coach for five weeks in Lima and participated in the Team Mastery UK coaches’ development programme. During these projects and my own journey as a Team Entrepreneur in Tiimiakatemia Jyväskylä I’ve had many interesting conversations about the methodology behind Tiimiakatemia with coaches, co-team entrepreneurs, parents, friends and clients. Even though Tiimiakatemia has a 25 year old history, it’s still considered to be a strange way of learning from the traditional school system’s point of view. What is Tiimiakatemia truly about? What do students really learn when they become Team Entrepreneurs? It can be hard to understand the benefits of studying in Tiimiakatemia because of its exceptional learning methodology. Inspired by these thoughts I decided to interview Tiimiakatemia alumni for my thesis research to find out what kind of skills they have learned in Tiimiakatemia. The aim was to gain understanding on the Tiimiakatemia methodology and what kind of skills the students learn during their studies that are truly useful in work life. During the fall 2018 I interviewed 6 alumni, who have graduated from Tiimiakatemia Jyväskylä and have been in work for at least two years after their graduation. At the time of carrying out the research the interviewed alumni were working as entrepreneurs, facilitators, business coaches and project managers. Here are 3 things that give a small glimpse of what kind of useful skills are learned in Tiimiakatemia. The set of skills that almost all the interviewed alumni told they had learned were dialogue and communication skills. In Tiimiakatemia these skills are specifically developed in the team’s training sessions held twice a week. In the training sessions the team sit in a circle for four hours sharing their learning, sparring with each other and creating new knowledge together through dialogue. According to the interviewed alumni these dialogue skills are essential in work life as open dialogue creates common understanding and new knowledge. It came out that many of the alumni still share knowledge, learn and develop from each other by having dialogue and reflecting on their current work. Trust and respect for each other was stated to be the foundation of a fruitful dialogue. When people trust and respect each other, they have courage to express themselves and their thoughts genuinely and to challenge each other’s point of views without fear of personal attacks. The aim of dialogue is not to have a conversation about whose point of view is right or wrong, but to create knowledge that is greater than the individuals’ knowledge. Many of the alumni stated that in Tiimiakatemia they learned valuable learning-to-learn skills. For them it means that they learned to take responsibility of their own learning, to evaluate critically what kind of information is relevant for them and what kind of skills they need to learn to reach their goals and to be better in their work. Tiimiakatemia is a learning environment where the responsibility of learning is on the learners themselves. The team coach is there to support the process – not to teach or give answers. Learning in that kind of environment teaches a proactive attitude, which is highly appreciated in work life now and in the future. The alumni said that Tiimiakatemia has given them the desire to learn and constantly keep developing themselves, which they think is essential in the rapid and constantly changing work life. Finally, the study showed that the alumni valued the mindset and courage to learn through experimenting and reflection in their current work lives. 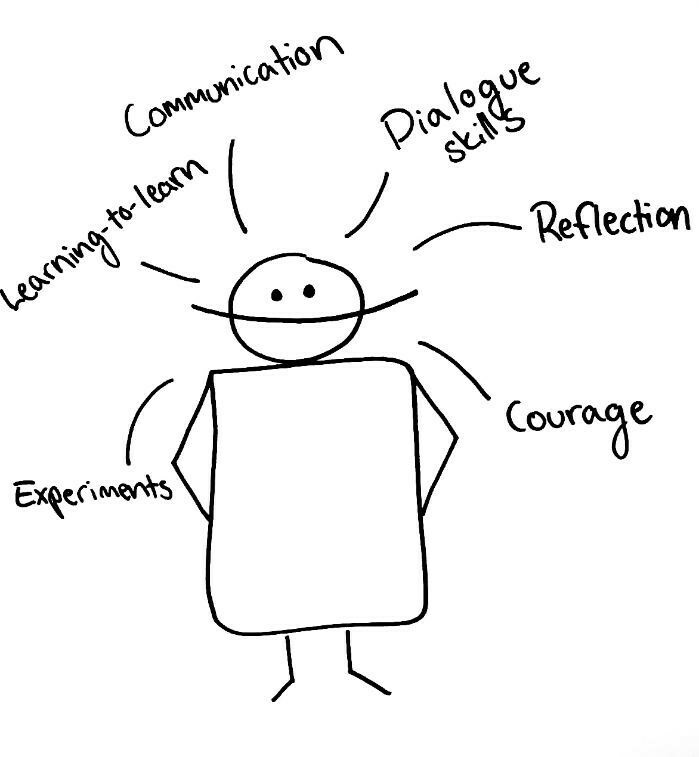 These skills go hand-in-hand with the learning-by-doing in Tiimiakatemia. Taking plans into action creates tacit knowledge which turns explicit when the experiences are reflected upon together in a dialogue. It’s exciting to notice how this links straight to the Nonaka & Takeuchi’s knowledge creating theory! Surprisingly most of the interviewed alumni told that they still use the four question of Post Motorola tool that they learned in Tiimiakatemia. However, something that turned out to be more important than the tools is the mindset of putting new ideas into action as soon as possible, to be able to learn from the experiences and to constantly develop their business. Tiimiakatemia provided them a safe environment for trial and error, and encouraged them to put ideas into action at an early stage even though the outcome would be uncertain. It was particularly interesting to notice that the skills the alumni valued the most in their work nowadays are metacognitive and hard to measure. Needless to say, the study showed only a small glimpse of the skills that can be learned in Tiimiakatemia, but in the era of a constantly developing robotics these human skills are something that never go out of date. To read the full research paper (in Finnish) go to http://www.theseus.fi/handle/10024/158796.